As a book lover and a mother, I have a list of books that keeps growing of all the books I am excited to read with my kids. My son recently turned 6 years old, so most of these titles are getting closer and closer to reality. I get giddy thinking about introducing him to Harry Potter, Narnia, Roald Dahl and Rick Riordan, just to name a few. And, now, I have a new title to add to that ever-growing stack of fantasy books. 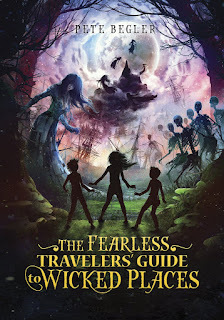 I am pleased to introduce children’s book fans to The Fearless Travelers’ Guide to Wicked Places by Pete Begler. Let me begin by saying, whoa. This book is fantastic! I mean, you should recognize if I am grouping it with Roald Dahl and Rick Riordan, it means I am a big fan. Children’s books for middle age kids are often hit or miss for me, but the ones that stand out are amazing. This is definitely the case for The Fearless Travelers’ Guide to Wicked Places. This hefty novel contains several fast-paced chapters with exciting and scary adventures that make the pages fly by. As an adult, I had a hard time stopping reading to do the things I needed to be doing. The novel focuses on a young girl named Nell who has the gift of seeing what others around her cannot see. When her mother is taken by a cloud of witches, she and her brothers must make a trek into the Wicked Places, the land of Dreams and Nightmares, to save her. Imagine every good dream and every nightmare you had as a kid – they are brought to life in this book. The children can fly as comets, animals wear clothing and whales are made of stars. But, there are also scary, evil clowns, skeletons and clouds that rain knives and blood. It is a delightful fright fest (if there has ever been such a thing, this is it). While Nell and her brothers and their new friends have to battle evil enemies, travel through various dream worlds (beautiful and terrifying) and find their way through mazes, they must also remember who they are. By staying true to themselves and saying yes to facing obstacles, they will find their way home. This book was so much fun! I cannot wait until my son is old enough to read this one. If you have a reluctant reader, this would be a great choice. It has something for everyone. This book was just released this week and I am thankful I got to be one of the first to read it and tell others about it.